Access to the internet is easier for most Britons, but many still need a reason to use it, says a study. Some 59% use the net regularly and only four per cent have no access to somewhere with web connection. "While the battle for digital access is being won, we now face a struggle to convince everyone the net is worth using," said Professor Richard Rose, of the Oxford Internet Institute. The "digital divide" is now more about access to high-speed net services. 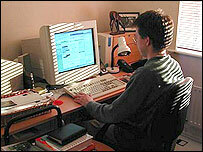 The figures are encouraging news for the government, which has a target of getting online access for all by 2005. But the results show the digital divide in Britain is changing shape, with the gap becoming more about unequal access to high-speed broadband than to the net in general. Educational differences and fear of technology have little to do with why people do not use the net. Instead, they just cannot see why they should and what it will offer them, the survey of more than 2,000 people found. "People who don't use the internet don't see how it will help them in their everyday affairs," said Professor Rose, the author of the report. "For example, older people have been educated, earned a living, shopped and paid bills for most of their lives before the internet came along." "Government and commerce will have to wait a generation or more before nine-tenths of Britons regularly use the internet." 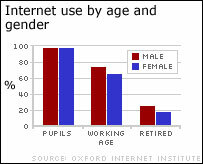 The research shows access to the net still varies with age. It found 22% of retired people surf the net, while 98% of those still at school and 67% of working age go online. The average person is able to get the web from home, work, school or the public library. And although most people know about the net, the 20% who do not go online do not care about using the net for e-mail or information. Professor William Dutton, head of the Oxford Internet Institute said the numbers of people going online will continue to grow, as people spend more time doing different things on the net. The roll-out of broadband across the country, allowing high-speed internet access may offer those who have not gone online more of a reason to do so. But as yet only 11% have access at home, offering possibilities like online gaming or video on demand, and availability is patchy across the country with many rural areas missing out, says the survey. Despite this, new figures from analysts say the UK was the fastest-growing broadband country in the world this year. 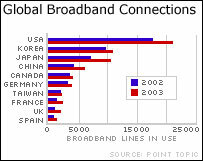 Overall, though, it is still ranked ninth globally in terms of broadband connections. The number of homes and businesses with broadband worldwide, via cable modems and DSL (digital subscriber line) grew to 77 million in the first six months of 2003, according to the figures from analysts Point Topic. Top of the league is the US with 20 million broadband connections while South Korea and Japan have 21.3 million.